Discussion in 'BMX & Dirt Jumping' started by RD3, Jan 12, 2008. YES! that's a amazing looking bike. the latest revision of the mountain bmx? and thank you for jogging my memory, i almost forgot about them; thicks are sick. reminds me of a 26" T-1! me likes! Its the same frame that is pictured on the Thick site in the raw. I have had the frame for about a year. Its a very comfortable feeling frame also forgiving if you are off on your landing. It feels balanced in the air, just need a little more pop to get it up there (weight is 33-34 lbs). The frame is built pretty much to last forever. I really want to like these guys more than I do. Yours looks sick but I have a hard time taking this one too seriously, especially with their description. 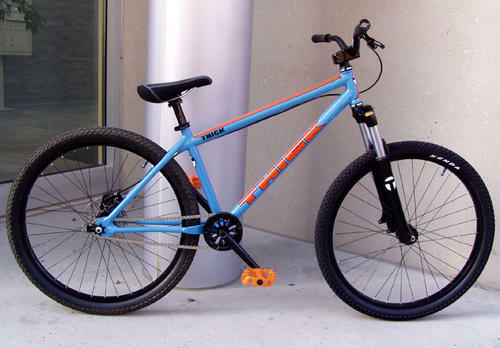 You have keep in mind that the Thick FKNBKE full suspension bike was made over 10 years ago, mid 1990s era. 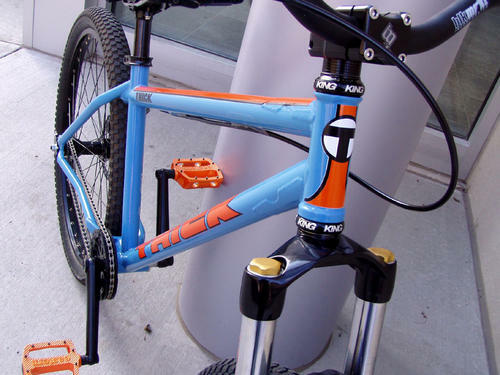 Thats before a dh bike was a dh bike. Pretty ahead of its time, just like the Brooklyns from back then. I would like to get my hands on one just for fun. Fair point. In that case suggest they update their website. solid bike, nice work. You got some crazy stuff RD3! I am so happy that frame/bike went to a good home. When I was selling it, I got a bunch of emails but RD3 was one of the first and IIRC was knew very much that he wanted it - the transaction was easy as pie. 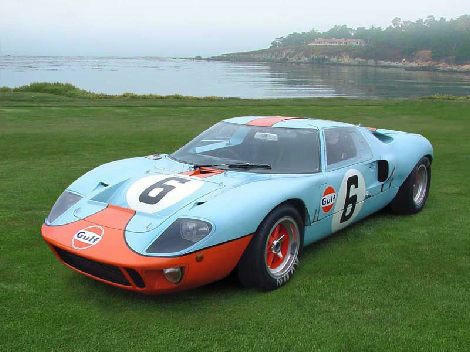 Great job w/ the rebuild - I love the GT40 color scheme. 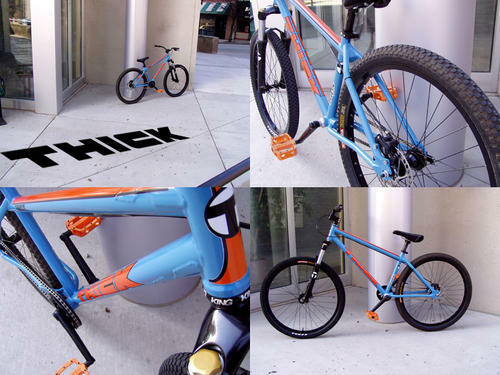 I contacted Chris @ Thick about a custom frame build years ago. I wanted something a little different than what was out there with touches like the T-1/Taj seat junction and gusset and Phil Wasson/FBM dropout. It's got a stable feel to it, not so great with spins but real good on straight DJ's. I ran it with a slightly lighter part and it feels more responsive esp w/ a lighter/shorter fork. But that DJ1 is a time correct fork - 2004. One funny thing about that day I remember most is Dominic Biro hopping on that Thick for a couple runs. Dom is a wicked 20" rider and he said he'd never been on a mtb before. He got thru a most of a good sized run first try. Then 2nd run hit the whole line. Smooth as ****. Like I said, glad RD3 got it as I know it will always be dialed and out for rides. Glad you saw the new photos of it. 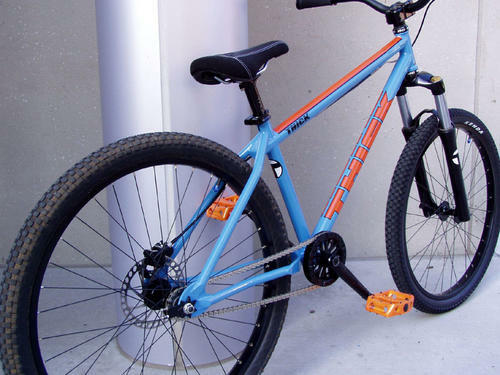 Kinda weird how the color scheme worked out... it was already the blue color when I bought it, but after I put the orange pedals on it, I knew what it had to be. Its a super cool frame, glad I was lucky enough to buy it from you. yeah, I love that light blue - so much so I did another frame in it. The color/graphic scheme you did cound not look any cooler - very good job! Yeah, whatever. I got a few rides on that bike when I lived in New York. The description is certainly no exaggeration. Glad to see Chris is still hard at work building solid rides. Nicely done, Chris/THICK! dang that bike is hot!